Light cure resin reinforced glass ionomer cement specially formulated for cementation of orthodontic brackets, bands, and acrylic appliances. No etching required and may be used in a moist field. Provides long-term fluoride release to aid in the prevention of white spot lesions. Working time 3' 30", Setting time in mouth 3' 00". 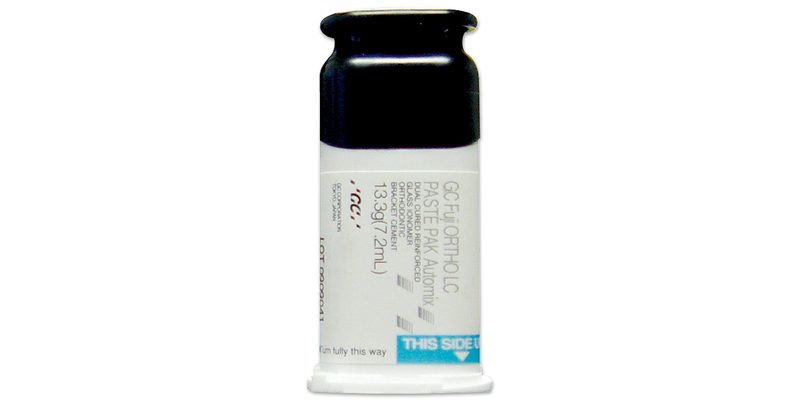 Contains: 2 x 13.5g (7.2ml) Paste Pak cartridges. Contains: 1 x 13.5g (7.2ml) Paste Pak cartridge, 2 x 1.4g syringes of Ortho Gel conditioner, 20 mixing tips, 15 brush tips.